With a wide variety of shade and awning products at competitive prices, Hawk Awning Company, Inc. has been the industry’s leading provider of residential and commercial shade and awning services for nearly 15 years, serving Baltimore, Maryland, and all of the surrounding cities. 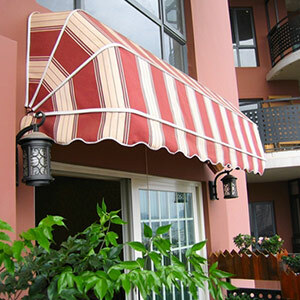 When it comes to custom canopies in Baltimore, MD, both homeowners and business owners turn to Hawk Awning Company, Inc. for design and installation services they can trust. We offer a staggering variety of materials, fabrics and designs to help you get the perfect awning, shade or canopy for your building. We make your satisfaction our primary focus, so our talented professionals always take the time to consult with you about your building’s design and your shading needs to ensure your awning installation in Baltimore, MD, is a perfect fit both aesthetically and functionally. Our materials are top-quality to save you maintenance and lower your energy costs. We offer a range of materials and sizes to give you the perfect fit. We offer full service Monday through Saturday for your convenience. We service a 50-mile radius around Baltimore, MD, including Washington, D.C. and Anne Arundel, Harford, Carroll, Frederick, Montgomery, Howard, and Prince George’s Counties. "Very accommodating and friendly. Good service too!" November 2, 2016 John B. "We are very happy with the two awnings we had installed on our office building. The communication was great, price was reasonable, and insta..."
"I can't say enough about the service and workmanship of Hawk Awning Co. George was personally involved making sure we were completely happy..."
"Hawk Awning installed our awning several years ago and it has been a great addition to our home. I had a small issue with the remote control..."
"Hi George Just wanted to sincerely Thank you for fixing our back porch awning pin and for replacing the awning canopy material . It was..."